Witness at Home, Web and Everywhere! "Jesus did it. All Glory to God!" "The Glory of the Coming of the Lord is at Hand"
"At the Cross the Worst of Man met the Best of God"
The Longest Walk! This is the 51st year of me carrying the cross around the world in every nation. 1968-2019. The Guinness World Record for the longest walk/pilgrimage. Over 42,788 miles (68,860 km) in 324 countries, island groups & territories. 85.5 million steps and over 19 billion pounds carried. Sharing Jesus, the cross and the gospel message. My wife Denise has driven in front with supplies and has been with me in 294 countries. I’m still walking in 2019! We are just pilgrims, donkeys lifting up the cross and Jesus. God bless you. Stations of the Cross! Good Friday! Easter Sunday Message! Jesus, bless you. Click here to watch on our YouTube site below: “The Stations of the Cross” “Jesus is Alive” Easter Sunday Message! Glory in the Cross! Carry your Cross! Message of Hope! This is real Arthur Blessitt preaching about how God loves us and know our name. It is the message of hope, love and blessings and salvation that he has preached around the world. Hope for the hopeless and good news for the broken and love for all. DVD - U.S. Format only (NTSC)Message of Hope! This is real Arthur Blessitt preaching about how God loves us and know our name. This is the most requested message of Arthur Blessitt's life. A real classic from the early 80's. About how to live ones life in the Presence of God. It's about a moment by moment walk with Jesus that is unending. God told Moses "My Presence shall go with you". Jesus now indwells the heart of the born again follower of Jesus. Powerful message of how to fall into the arms of Jesus when needing salvation or facing difficult times in life. This is one of Arthur's best evangelistic messages. Every person should hear it. Ideal for yourself or your friends. U.S. Format only (NTSC)Powerful message of how to fall into the arms of Jesus when needing salvation or facing difficult times in life. Jesus, Just Jesus is the most requested message I've preached! 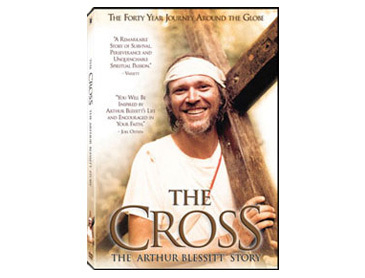 Arthur Blessitt has carried the cross around the world in every nation and is listed in the Guinness World Records for the world’s longest walk over 42,788 miles 68,860 km, in 324 countries, island groups & territories for 51 years.